(Newser) – The USS Zumwalt was designed two decades ago, and three Zumwalt-class destroyers have been in the works for years. So how the US Navy missed the fact that it wouldn't be able to afford the ammunition for the Zumwalt's $22.5 billion, 155-millimeter Advanced Gun Systems, specifically designed to house 600 rounds that could hit land targets up to 80 miles away at a speed of 10 shells per minute, "is a mystery," reports Popular Mechanics. That's exactly the case, however. The Navy is now looking for alternatives to the GPS-guided Long Range Land Attack Projectiles just weeks after the warship was commissioned because a single round costs $800,000, and that's just the low estimate, a Navy official tells Defense News. 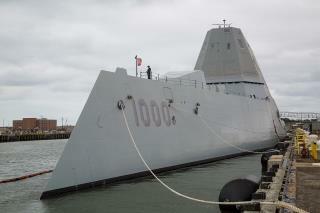 you cant call this a warship, but it will still be able to fight if they give every one a sling shot! FUBO FUBAR! THEY SHOULD HAVE CALLED IT THE USS WHOOOOOOOOPSY CLASS. Typical government procurement tactic - especially for the Defense Department. I went through this first hand on the LHX (Light Helicopter Experimental) program. The program was presented and quotes obtained on the basis of something like 6,000 helicopters being built and 15,000 engines. It was about 30 years ago so I have forgotten the exact numbers. Two companies were selected to build flying helicopter test models then the Army / DOD started changing everything. The schedule changed, the mission changed, the quantity changed. Over the next decade the program lingered and the companies lost millions of dollars supporting a program that went nowhere. The Army constantly decreased the projected procurement quantity while simultaneously extending the delivery schedule and complained that the companies were increasing the unit price.. dah ! If YOU negotiate a price for 1000 gadgets then decide you only want to buy one do you think you should get the 100 unit price? Another in a long line of high tech, unaffordable boondoggles approved by Congress, at taxpayer expense. Russia has traditionally taken a different view of weapons procurement, choosing to stay, as much as possible, with tried and true conventional weapons systems. They still use the Bear bomber, with its counter-rotating turbo-prop engines. If it ain't broke, don't fix it. An example of our own dated but excellent technology: The A-10 Warthog, a tough, highly effective aircraft which the military brass, Congress, and the weapons manufacturers, would like to replace, because there's money to be made, by doing so. Its time to put military procurement on a diet of common sense, and wean it off the drug of profit.